The UR92 is a combo Duplex Radio Transceiver and Infrared Receiver Panel. Using a UR92 means there is no need to plug in to select your loco when you are using a Digitrax Duplex equipped “D” throttle. 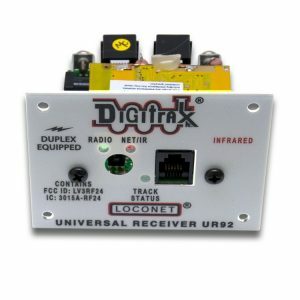 The IR receiver on the UR92 also allows you to go wieless with your other Digitrax throttles that are factory equipped with infrared emitters.